A number of factors seem responsible for the widening of the wealth gaps during the economic recovery. 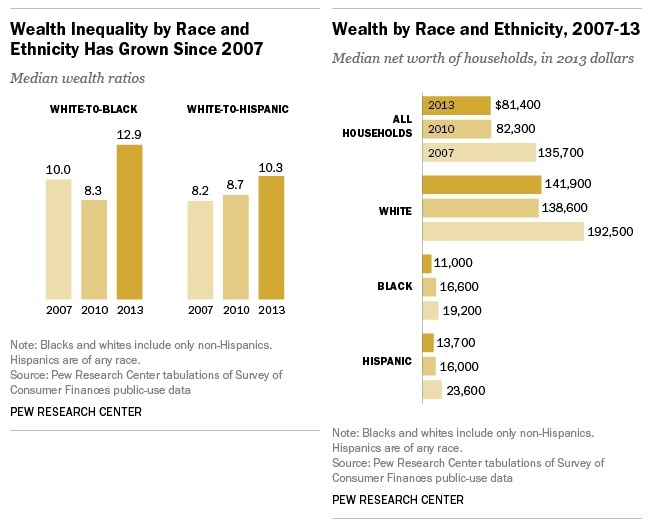 As the Federal Reserve notes, the median income of minority households (blacks, Hispanics and other non-whites combined) fell 9% from its 2010 to 2013 surveys, compared with a decrease of 1% for non-Hispanic white households. Thus, minority households may not have replenished their savings as much as white households or they may have had to draw down their savings even more during the recovery. Also, financial assets, such as stocks, have recovered in value more quickly than housing since the recession ended. White households are much more likely than minority households to own stocks directly or indirectly through retirement accounts. Thus, they were in better position to benefit from the recovery in financial markets. All American households since the recovery have started to reduce their ownership of key assets, such as homes, stocks and business equity. But the decrease in asset ownership tended to be proportionally greater among minority households. For example, the homeownership rate for non-Hispanic white households fell from 75.3% in 2010 to 73.9% in 2013, a percentage drop of 2%. Meanwhile, the homeownership rate among minority households decreased from 50.6% in 2010 to 47.4% in 2013, a slippage of 6.5%. While the current wealth gaps are higher than at the beginning of the recession, they are not at their highest levels as recorded by the Fed’s survey. Peak values for the wealth ratios were recorded in the 1989 survey — 17 for the white-to-black ratio and 14 for the white-to-Hispanic ratio. But those values of the ratios may be anomalies driven by fluctuations in the wealth of the poorest — those with net worth less than $500. 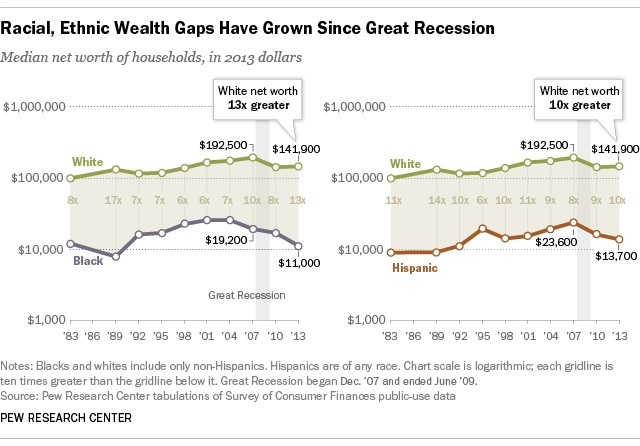 Otherwise, the racial and ethnic wealth gaps in 2013 are at or about their highest levels observed in the 30 years for which we have data. Rakesh Kochhar is Associate Director for Research at the Pew Research Center. Richard Fry is a Senior Research Associate at the Pew Research Center’s Hispanic Trends Project.